It is finished. It is blocked. It is amazing. Be Simple Variations is a very simple pattern. This is my first shawl (maybe it’s really a shawlette. 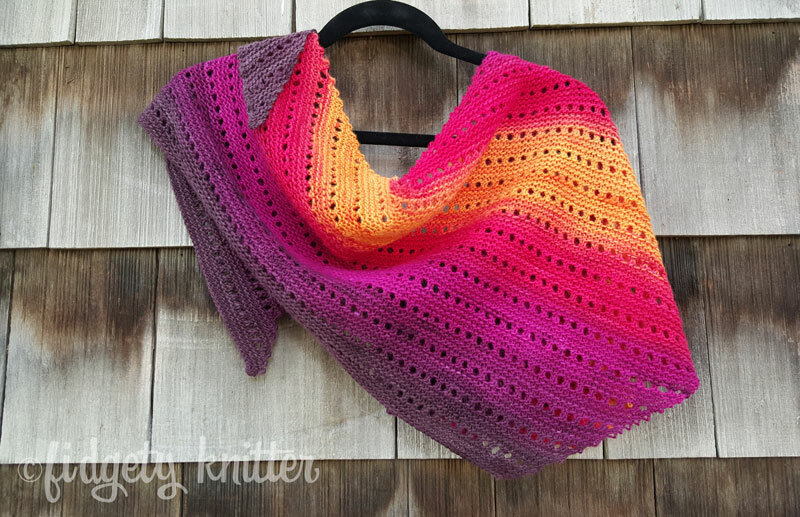 It seems like a baby shawl) and it was a great pattern to knit. This is a simple pattern knit in stockinette with a two row repeat (plus the yarn over row). 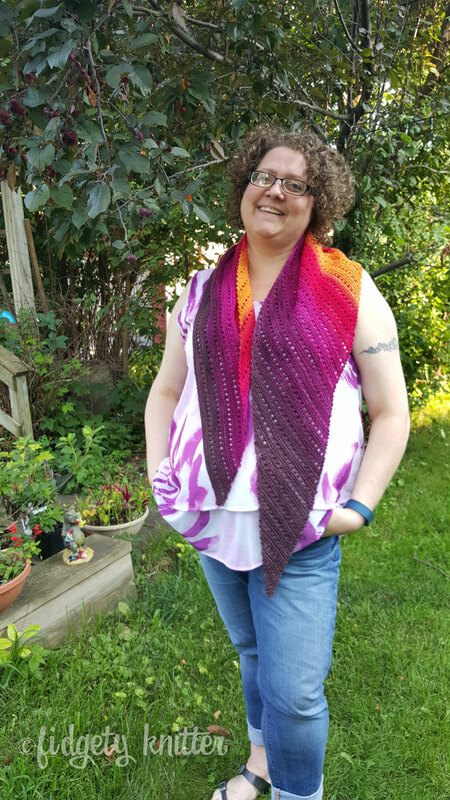 It’s an asymmetrical shawl and I wish I had one more ball of yarn so I could have made this a little larger. But alas, I only had two. Finished, the shawl measures about 66″ along the long edge and about 16″ deep. Come fall and winter, I think this will be the perfect scarf (especially since my winter coat is black and my workplace gets chilly). I knit the shawl on size US 7 cable needles. I did keep a counter going so I could track when I needed to yarn over. 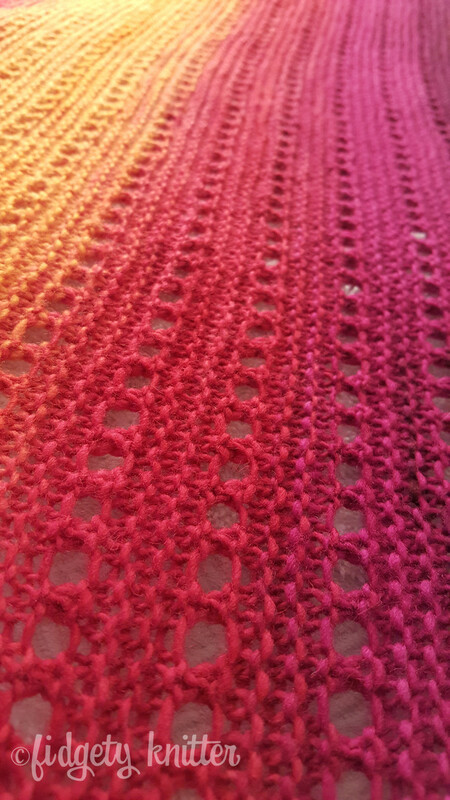 If I’m going to keep knitting these shawls, I will need to get better at counting my rows. I blocked it out as aggressively as space would allow. I wanted to open the holes and give the scarf a larger, lacier feel. This would be the perfect pattern for beginner knitters. It’s simple, it’s portable and it is really pretty. Let’s be honest, though. The real superstar of this project is the yarn. My camera doesn’t do this yarn justice. The color transitions are fantastic and gentle. Knitwhits Freia Handpainted Ombre is 100 percent wool. This color is called Flare and each ball is about 75 grams/217 yards. I had two balls of the Freia and they were wound opposite of each other. This allowed me to knit them from the center and easily transition from purple to yellow and back to purple. When I purchased the yarn I remember thinking it was a silly selling point. But I found it useful since I like to knit from the center. Not having opposite wound balls would not stop me from using this yarn again. After washing and blocking, it’s still scratchy, although it softened up a little. Honestly, I don’t care. This yarn is just so beautiful. What projects have you finished recently? Looks beautiful! I’m a beginner knitter and wondering if you could offer me some advice- I’m making the basic version of this shawl (chunky wool, 5.5mm needles)and so far it’s only 20 inches long but already 10 inches wide at the needle end!! It’s going to end up being enormous!! Am I doing something wrong or is it supposed to be like that? So this is a pretty shallow shawl and asymmetrical. In the picture where I have it spread out behind my arms, the beginning is the point in my left hand. So the cast off edge is from the point in my right hand to the off-center point of the shawl neat my waist. I can’t remember how deep it was (from point to long edge) because I gave it away, but it was not deep. 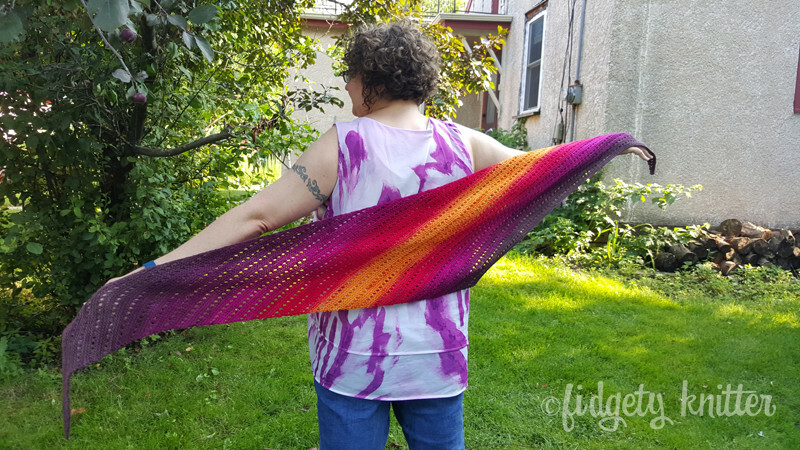 In the end, it’s long but not a draping shawl. Does that help?